My Instagram feed has been full of proteas over the past two weeks! Yes, these lovely blooms are in season, but I've seen them in art and fashion too. Many of us think they are native to Australia but they're actually from South Africa, where they are also known as Sugarbushes, and according to local tradition, they represent change and hope. They are so well suited to our climate, and work so well with other natives, it's no wonder we've seconded the protea for ourselves. 1. The gorgeous kitchen in Clare Barnes' home, taken by Clareb8 on Instagram. 2. 'Yellow honeyeater' sweater from Gorman. 3. 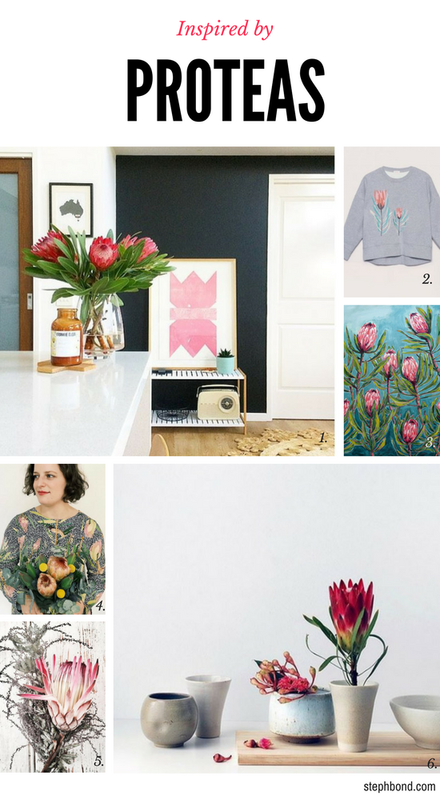 Pink protea print from Sweet William Prints. 4. Stunning Hannah Kallady in the protea print 'come and go' swing dress from Gorman and matching protea posy, from dukeofhannah on Instagram. 5. Ice pink protea still life by Barb Fisher on Instagram. 6. Mud Fusion bowl (centre) and Sayaka Ogawa Ceramics vessels shot by Lisa Tilse from We Are Scout. Nice round up Steph - the protea is such a great shape. Thanks lovely; and I'm lucky enough to have woken up to a bunch this morning, too!